Leela is designed to run on Linux. Although I believe it should works on other POSIX platforms, the only environment we have tested it is Linux. 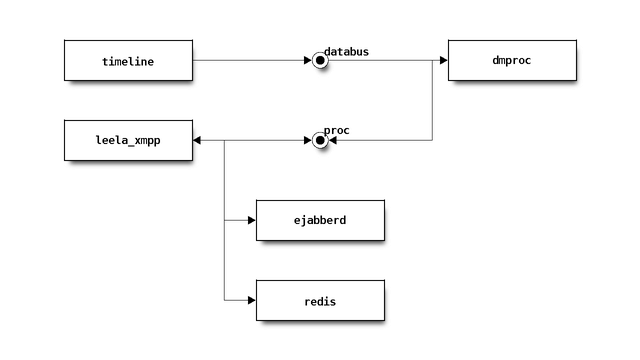 In the above diagram all components communicate using unix sockets, but external systems [cassandra, redis-server and ejabberd] which use TCP. This [the use of unix sockets] implies that everything must run on the same machine, or that you will a machine with a reasonable number of cores to sustain high loads. Following we provide more details about each component and how they interact with each other. 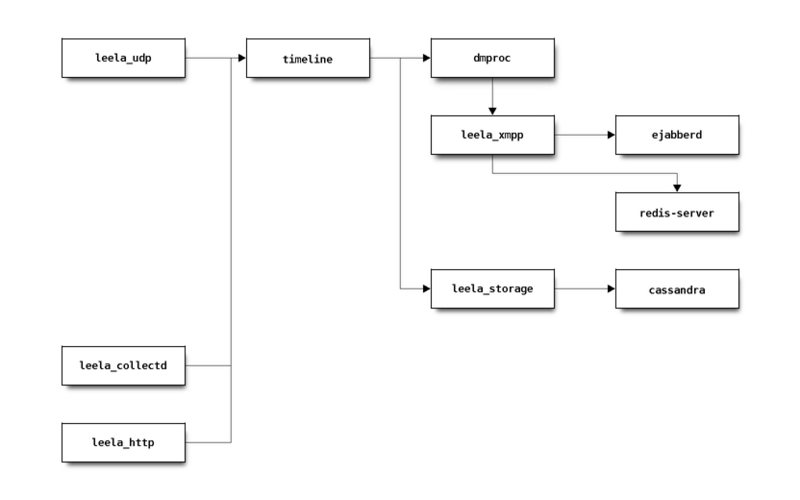 They simply parse the packet and forward to the timeline using the leela internal protocol. This exposes the rest API which allows you to retrieve historical data. It reads data from cassandra directly but in the future all reading and writing to the storage will be go through the leela-storage service. The HTTP provides a read/write interface. Writing are simply forward to the timeline, as the previous components do. This is the only component that effectively knows about metrics. You may think of it as a function that takes a metric and produces one or more events [an event is just a gauge type]. The databus socket is the one metrics should arrive. Each frontend [udp, collectd, http] writes one or more metrics into it. Then, if any given metric generates any event then the timeline writes them into the connected peers. This is done using the multicast unix socket. Interested processes should continuously register themselves using the multicast socket in order to receive the events that the timeline generates. The reason this must be a continuous operation is that the timeline purges dead nodes, i.e., nodes that are not sending register messages in a timely manner. This is the engine that allows users to monitor metrics as soon as they are received. Once started, it register itself in timeline in order to receive events into the databus socket, and exposes its service through the proc socket. The proc socket is the only one that is stream oriented. The protocol is fairly simple though. It prefixes all packets with its size, using a unsigned short [2 bytes] big endian encoded. Exposes its services as an user of a XMPP service using a language that resembles SQL. This module allows one to monitor metrics in real time via XMPP. The redis is used as a directory service. When a request is made by a user an new entry is written into the redis. Periodically, leela xmpp service reads from redis in order to know which users are requesting information. When a new entry is found, it establishes a connection with dmproc and any output is forwarded via XMPP to the users requesting the information. Similarly, whenever an entry is removed from redis the associated connection with dmproc is closed. The load on a redis server is very low, but it is extremely important to make sure it is always available. If the redis service become unavailable, so does the leela-xmpp.